Wonder how Restaurants Make Such Great Steaks? Try this Method on your Backyard Grill (or in your Oven). Have you ever wondered why the steaks from fancy restaurants are so good? They use a number of tricks to get their steaks seared hot and fast so they can achieve that perfect medium rare internal temperature and still have a thick, caramelized crusty surface. Some restaurants use very expensive broilers to do this and others use the method described here. The secret to the perfect steak is a combination of flavorings and intense contact heat. The perfect way to get this high heat is with heavy metal and by that, a heavy cast iron skillet. 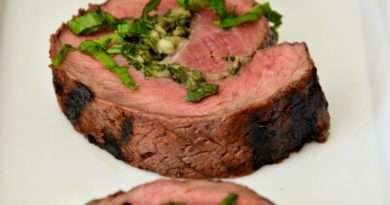 So, save yourself the luxury prices and make the perfect restaurant steak at home. Talk to your butcher about getting the right steak. I prefer a rib eye steak for this method. It can be either boneless or bone in. Strip steaks, fillets, or a T-Bone steak works just as well. The bone can reduce contact with the pan, however, so take that into consideration. To get the best possible results, look for a ‘prime’ grade steak. If this is too much money, choose ‘choice’. CAUTION: This cooking method requires extreme temperatures. Normal oven mitts will not be sufficient. High-temperature grilling gloves and a thick towel should be used when handling cast iron at high temperatures. Start by inspecting the steak. Loose pieces of fat or meat should be removed. 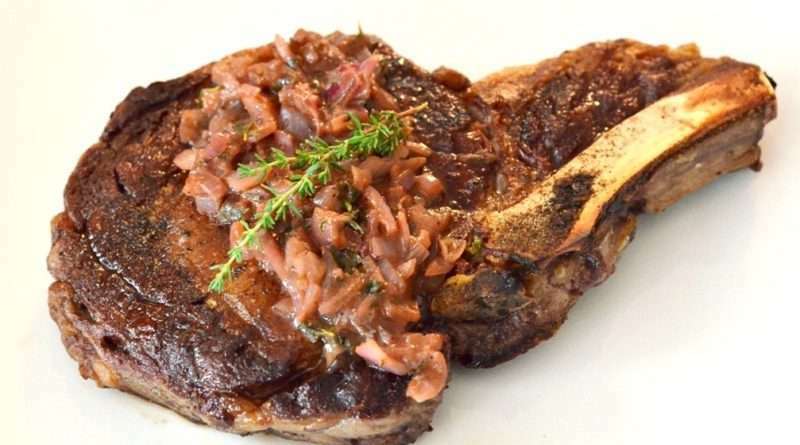 If the steak has a thick ribbon of fat running along the side, make cuts through the fat. Fat contracts quickly when cooking and can cause the steak to bend or lose its shape. Lightly coat the steak with oil. This needs to be a good quality, high-temperature oil like Avocado, light Olive Oil, or Canola. 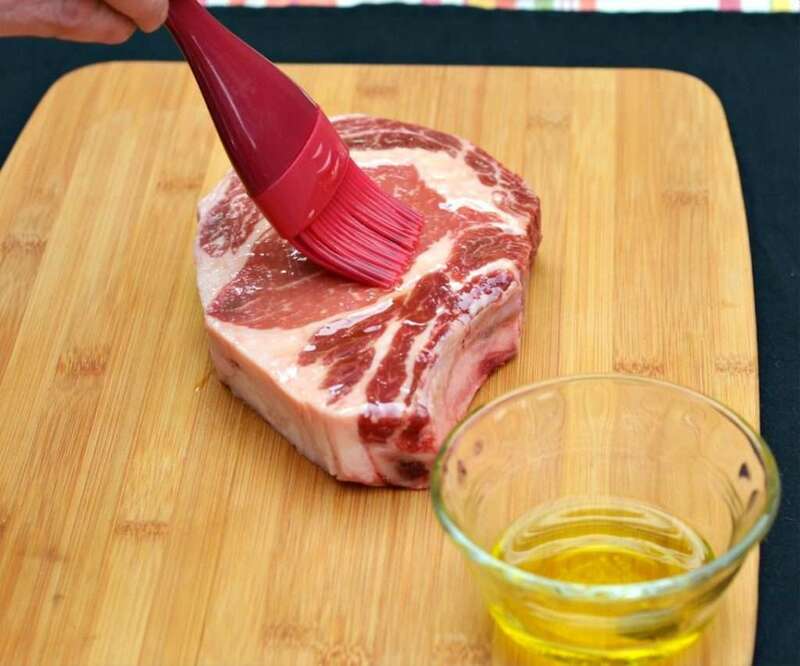 Brush the oil over the entire surface of the steak. 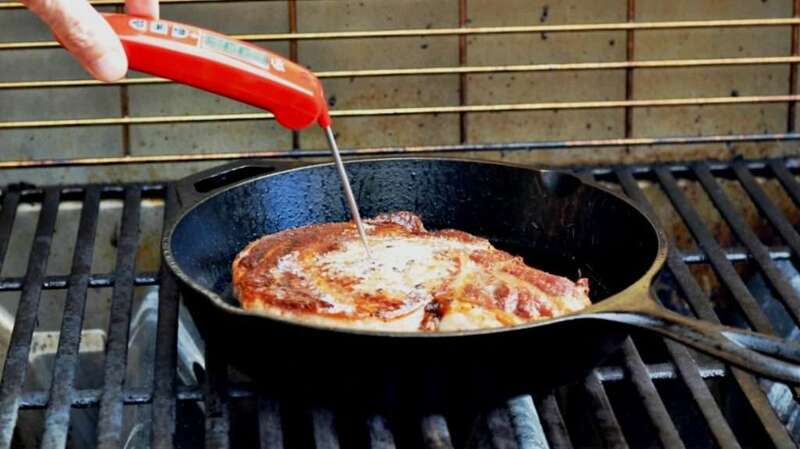 This improves contact with the cast iron pan. Once the steak is trimmed and oil it needs to be seasoned. It doesn’t require a lot, but salt is a definite must. Use a coarse salt to maximize the flavor and lightly sprinkle it over both sides of the steak. 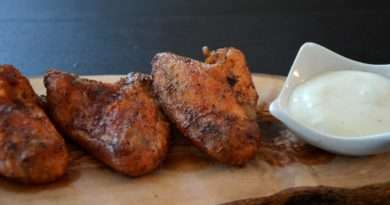 Black pepper is also a good idea and apply as much as desired. Again, it shouldn’t be a heavy dose but an even sprinkling enhances the flavor. Many restaurants add a light herb to their steaks. Because this is going to hit high temperatures, it should be dried. Thyme, rosemary, or basil work perfectly. A teaspoon or two will be sufficient. Do the seasoning before preparing everything else. The steak should sit at room temperature with the oil and seasoning on for between 15 and 30 minutes. This helps bring the temperature of the steak up and allows the salt to penetrate the surface. This adds in the formation of the crust of the steak. The secret of the perfect restaurant steak is the heat. This means getting the cast iron skillet as hot as possible. I’ve said before and I will say again, your normal oven mitt won’t do. At the very least use a thick and completely dry kitchen towel with the oven mitt or high-temperature grilling gloves to handle the cast iron. 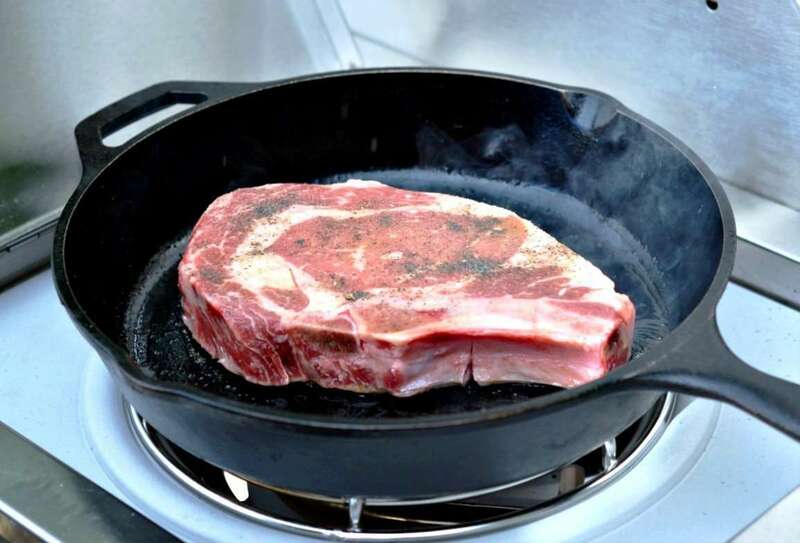 This method can be done on a kitchen stove top and oven or an outdoor grill. If the grill has a side burner, use that for the initial cooking phase. Light the grill (or oven) and preheat to 500 degrees F. Place the cast iron skillet on the burner or inside the grill if you don’t have a side burner. 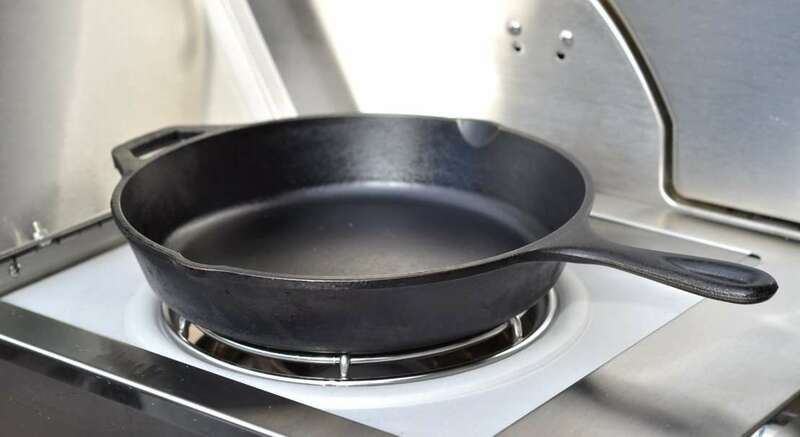 Ideally, the skillet should be preheated to a temperature as high as 700 degrees F. Once grill (or oven) and skillet are heated, it is time to start. There is going to be a good deal of smoke created in making this steak. Smoke alarms may go off. Be prepared. In fact, have everything, including the sauce ingredients ready before putting the steak in the pan. From here, the process will only take about 10 minutes, depending on how done you want your steak. To make this whole process work you need a smoking hot cast iron (or heavy duty) skillet. Smoking hot means smoking hot. It also needs to be clean and without any oil (other than what a good cast iron skillet is seasoned with) or cooking spray. All the oil you need is already on the surface of the steak. To test the heat, place a single drop of water on the pan. If it dances for a second before disappearing, the pan is hot enough. Make sure to have the steak, a clean plate, a heavy-duty grill mitt, a pat of butter and a pair of tongs ready. You won’t have a chance to step away once you start the cooking process. Get a large pat of butter. One to two tablespoons will be perfect. This will go on the steak as soon as it is turned so it needs to be ready and close by. With the skillet hot and everything else ready, place the steak in the pan. Ensure that the steak is in complete contact with the metal. It is this contact that is most important. There will be a lot of popping, sizzling, and smoke. This is normal. Let the steak cook on this side for two minutes. Do not lift the steak away from the pan or try to move it. Watch the clock and wait. Once the two minutes have elapsed, turn the steak and quickly place it back on the pan. Keep the heat on high. Make certain that the steak is set firmly on the metal. It should continue to sizzle and there should still be a good amount of smoke. 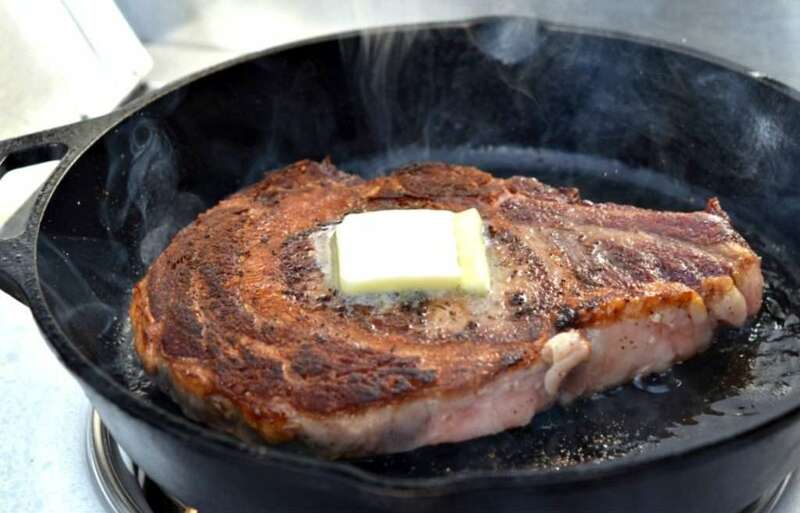 Place the pat of butter on top of the steak and allow this side to cook for an additional two minutes. 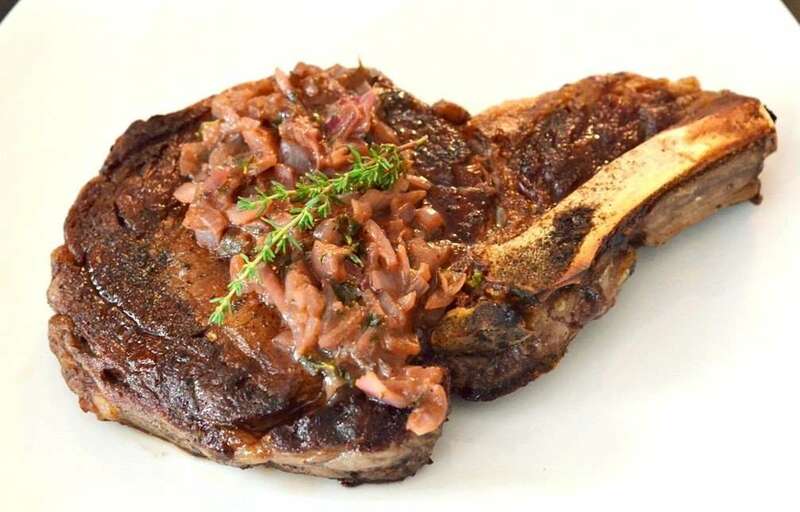 The top surface of the steak should be a rich brown in color. There should be signs of rich caramelizing. Take a minute to admire it, but not too long. Have towel, mitt, or gloves ready. When the two minutes have elapsed, move the pan quickly into the grill (or oven) and close it. For those who like their steak very rare, it is done. It will take a few more minutes (about four to five) to reach medium rare. With the steak on the grill (or in the oven) have a warm plate ready with the aluminum foil and the other kitchen towel. Also, have the sauce ingredients handy. Have an instant-read thermometer in hand and get ready to check the temperature. For a medium rare steak, the internal temperature should be around 130 degrees F (55 degrees C) when it comes off the heat. 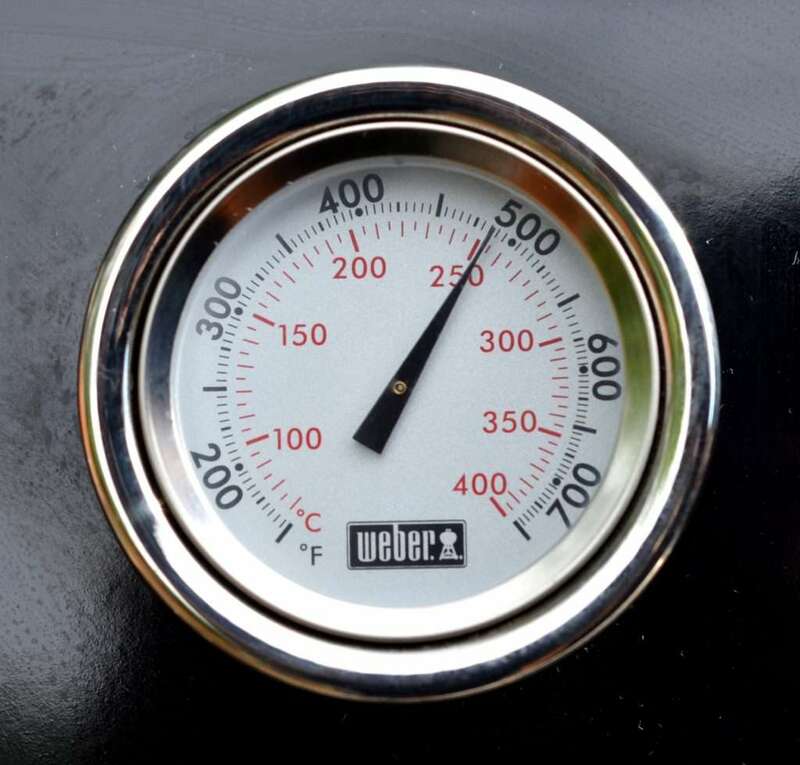 The internal temperature will continue to climb by about 5 degrees F before it is ready to eat. 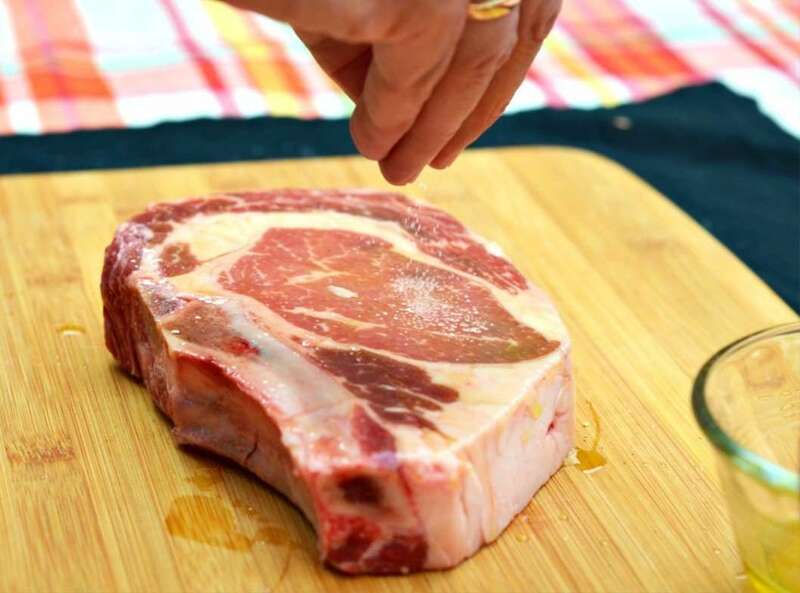 For medium, look for an internal temperature around 140 degrees F.
Open the lid and check the temperature in the center of the thickest part of the steak. 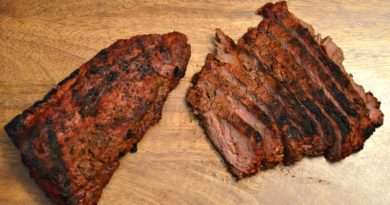 When it reaches the desired doneness, remove the steak with a pair of tongs and place on the warmed plate or cutting board. Place the foil over the steak and the other kitchen towel on top of that. Place the steak in a warm place and allow to rest while putting together the sauce. The cast iron skillet is still going to be very hot, but this sauce requires a good deal of heat as well. It should only take about two minutes to put it all together and reduce to the thickness of a paste. The skillet can be returned to the burner or left in the hot grill. If you are doing this in the oven, of course, return it to the burner. Pour the shallots and garlic into the hot skillet and stir to brown. Add the remaining ingredients. WARNING: The wine can cause a flash of flame when it hits the grill. Do not stand directly over the pan when the wine is added to the sauce. 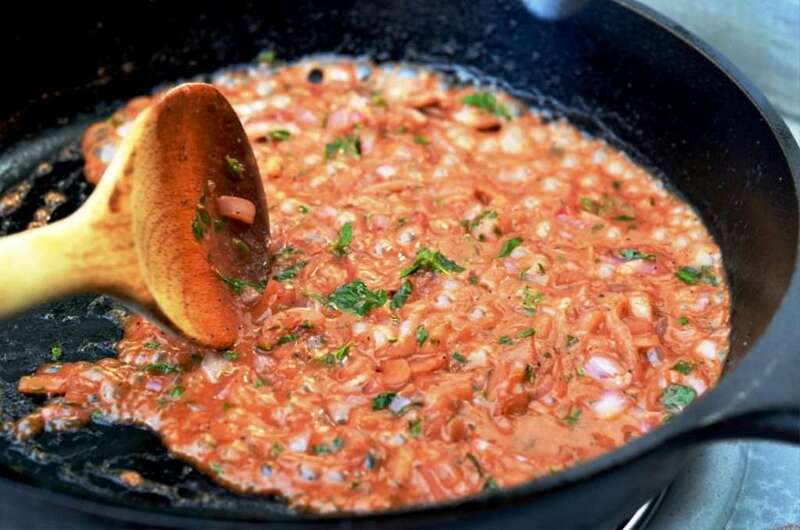 Stir together all the ingredients over a high heat until the sauce thickens. With the sauce ready, remove the towel and foil. Place the steak on a serving plate and cover with the hot sauce. It is best to be ready to eat right at this point. Enjoy!